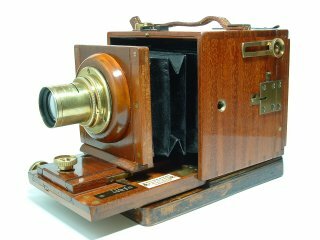 The main feature of this site (eventually) will be a virtual museum of Classic & Antique Cameras and related Photographic Ephemera. 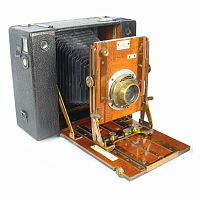 The photographs on this initial page are just intended to give an overview of the type of antique and classic cameras that the site will eventually feature, concentrating on the period from the 1880s through to the 1930s (rollfilm and plate cameras). 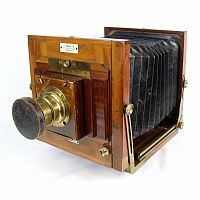 The site describes cameras and related ephemera that form part of a private collection, and the hope is that that this will illustrate the development of photography over this key period through the equipment that was available at the time, particularly to the amateur user. While concentrating on rollfilm and plate cameras, the collection is quite varied and includes items from many different manufactures. 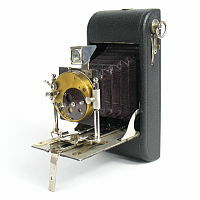 However, the collection is dominated by equipment made for sale in the US and UK, with some European cameras also being represented. 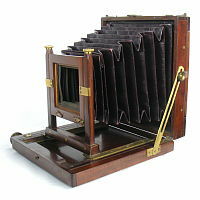 The links at the top left of this page provide an entry point to the camera collection by two different indexes: one lists the cameras by manufacturer and the other by camera type. Please note that these initial index pages may take a little while to load as they are lengthy and include thumbnail images. If you are trying to identify a camera and do not know the maker, the Type index might offer the best means of searching the content of my own collection. The categories used in the type classification are explained at the top of the Type index page. NOTE: This site is still under development. While the index pages are complete and each entry now has a link to individual pages that provide details of each camera (click on the thumbnail), very few as yet have corresponding photographs available. The layout of the site pages has been set up to work best at 1024 pixels wide. A brief note about the rating used for the scarcity of the cameras shown in these pages. A number of people will end up reading these pages with a view to trying to establish the likely value of some find. Be wary about equating the scarcity classification that I use with value. 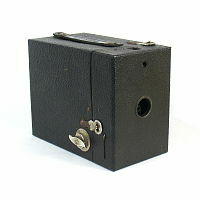 There are some very basic box cameras for example that are few and far between (so would be marked here as 'Scarce'), but have little intrinsic value. The table below summarises the classification scheme that is used, although this is based purely on my own experiences rather than being established through any scientific quantitative process! Common An online search of auction sites such as eBay in a given month has a greater than 50% likelihood of finding one or more examples of the camera. Uncommon An online search of auction sites such as eBay in a given month may be unsuccessful, but within a three month period there is a greater than 50% likelihood of finding an example of the camera. Hard to Find There is only a 50% likelihood that an example of the camera may be found in an online search of auction sites such as eBay over a period of a year. Scarce There is only a 50% likelihood that an example of the camera may be found in an online search of auction sites such as eBay over a period of five years. The remainder of this initial home page shows a few more examples of the type of cameras that you will find featured on the site and a list of recent changes to the site content. The picture at left shows a Blair Hawk-Eye Junior, for 4 x 5 plates and rollfilm and dating to about 1896. The collection contains a number of cameras of this age and type, together with mahogany and brass field cameras from the same era. The Kodak Bantam Special, dating from about 1938 or so, exemplifies the importance of style in later camera design (this one being one of many styled for Kodak by Walter Dorwin Teague) and the advances in technology over the period covered by the collection. 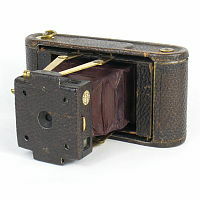 The Huttig Lloyd-Cupido camera shown on the left carries a Butcher badge on one side and was clearly marketed by them in the early 1900s (probably about 1907). 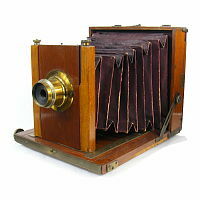 The camera has dual viewfinders attached to the front of the bed, rather like the early Ica Atom cameras, and a self-erecting front. It is an uncommon variant. It is designed for both rollfilm and plate use and incorporates an unusual lever mechanism to adjust the lens position to compensate for the difference in the position of the focal plane between these two formats. 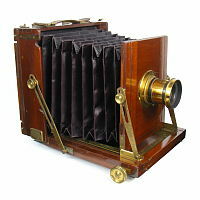 The Watson Alpha (¼ plate) is a very attractive and well made camera dating to some time after 1892. It has a very compact cubic design, which allows the lens to be kept on the camera when closed. This example has been cased throughout its life and the mahogany body and lacquered brass have retained much of their original finish. 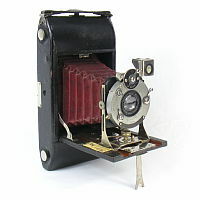 Added: Page added for The Folding Scout camera sold by Houghtons Ltd. 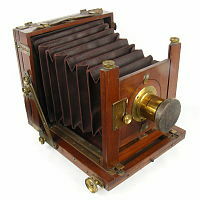 Updated: Photos added for the Folding Cornex camera produced by R & J. Beck Ltd.